3 GJH August 2007 ICT can be used as a tool to engage and motivate students more effectively provide opportunities for students to learn in alternative and challenging ways, using a wide range of sources of information and techniques to support critical thinking; support both collaborative and individual work; allow students access to authentic sources of information relevant to a particular enquiry by searching target websites on the Internet; allow students to identify and select the most useful information and sources when learning about religion and when learning from religion enable students to review, refine, redraft and modify work in progress; help students to refine and present their ideas more effectively and in different ways. 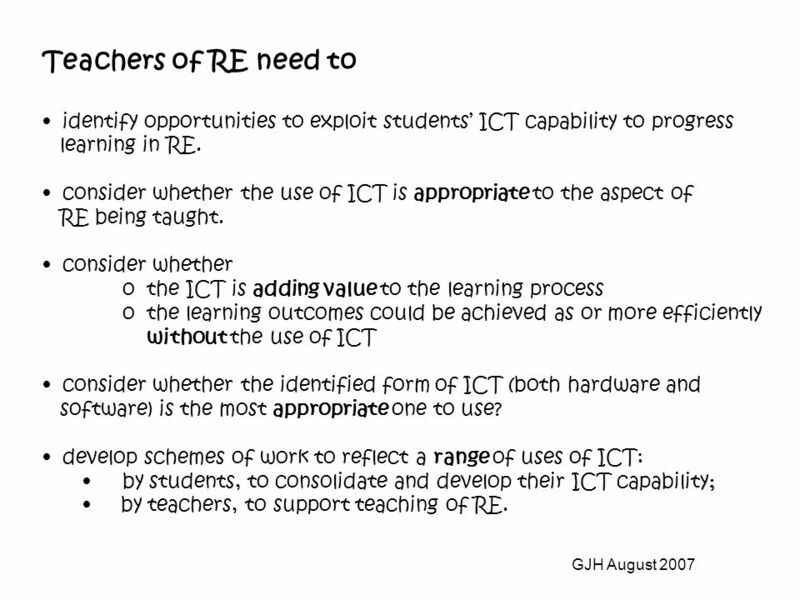 4 GJH August 2007 Teachers of RE need to identify opportunities to exploit students ICT capability to progress learning in RE. 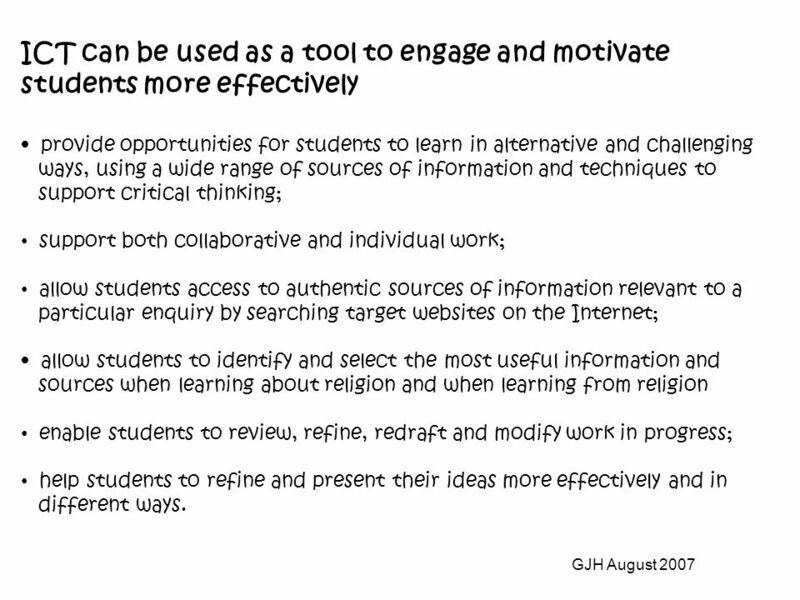 consider whether the use of ICT is appropriate to the aspect of RE being taught. 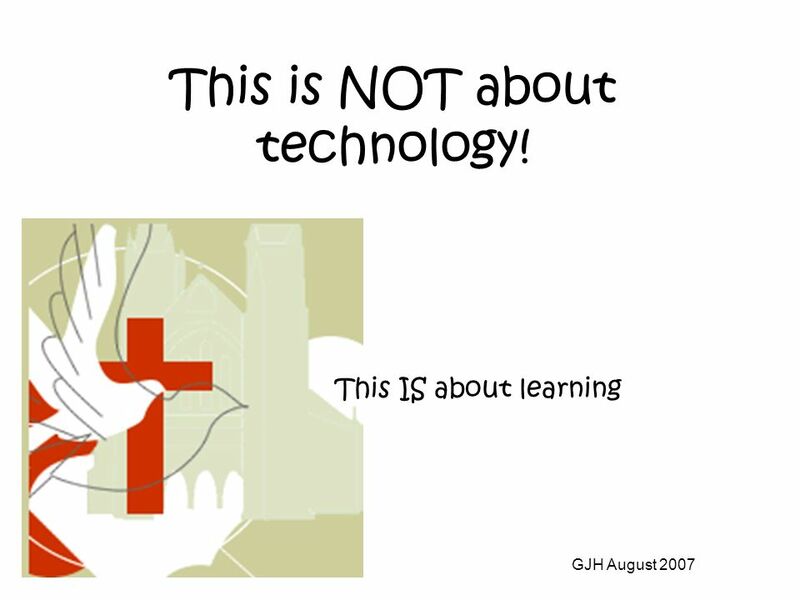 consider whether o the ICT is adding value to the learning process o the learning outcomes could be achieved as or more efficiently without the use of ICT consider whether the identified form of ICT (both hardware and software) is the most appropriate one to use? 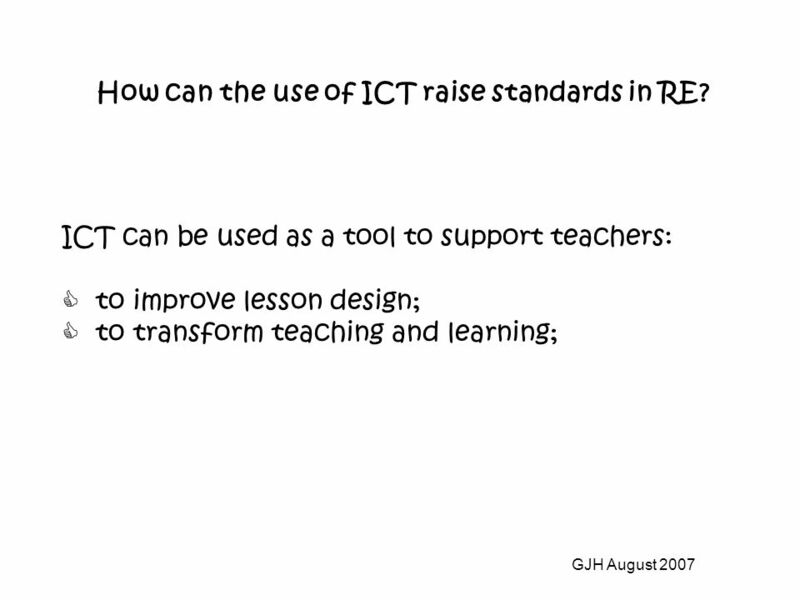 develop schemes of work to reflect a range of uses of ICT: by students, to consolidate and develop their ICT capability; by teachers, to support teaching of RE. 6 GJH August 2007 Does it…… allow students to investigate or be creative in ways not possible otherwise give them access to information not otherwise readily available; engage them in the selection and interpretation of information; help them to think through and understand important ideas; enable them to see patterns or behaviours more clearly; add reliability or accuracy to measurements; enhance the quality of their presentations; save time, for example, spent on measuring, recording or writing. 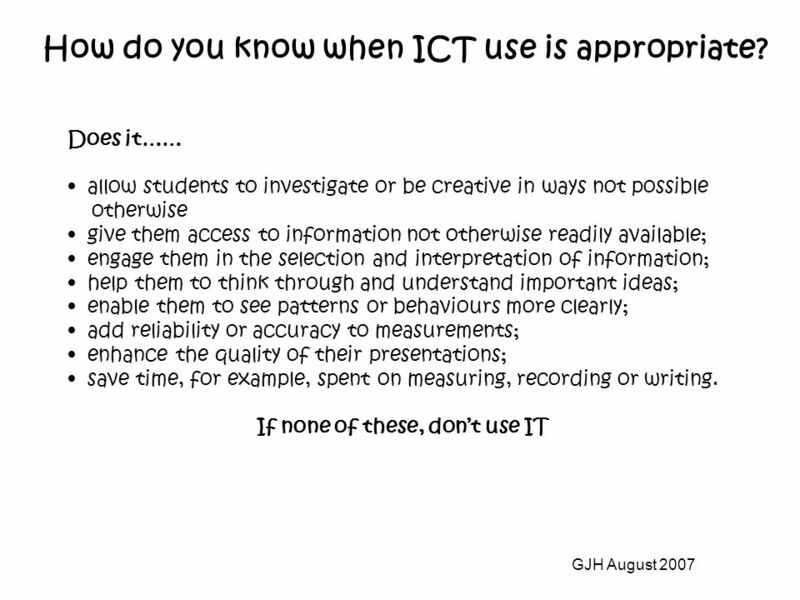 If none of these, dont use IT How do you know when ICT use is appropriate? 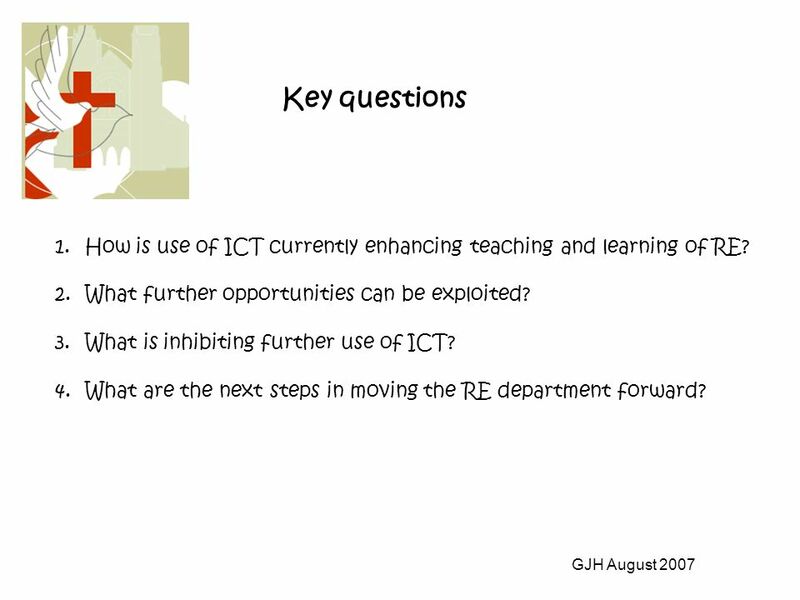 7 GJH August 2007 Key questions 1.How is use of ICT currently enhancing teaching and learning of RE? 2.What further opportunities can be exploited? 3.What is inhibiting further use of ICT? 4.What are the next steps in moving the RE department forward? 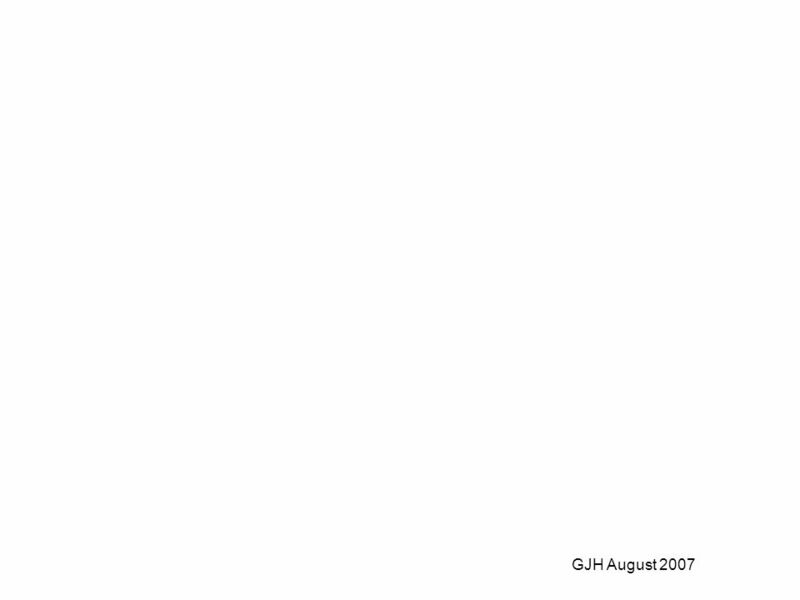 Download ppt "GJH August 2007 This is NOT about technology! This IS about learning." The curriculum – how inclusive is it?. Questions driving curriculum development Three key questions 3 How well are we achieving our aims? 1 What are we. Ofsted Preparation Session 2 How are your SENS supported?Christine. Key Stage 3 National Strategy Standards and assessment: session 1. Key Stage 3 National Strategy Standards and assessment: session 2. Some thoughts arising from: Thinking frameworks for planning ICT in science lessons Based on the article by Leonard Newton and Laurence Rogers (2003) School. Raising achievement in Geography Adding value with GIS Dave Hassell, Associate Director, Becta. Primary ICT Assessment What does good assessment look like? The ICT Assessment Toolkit © NEWLICT North East and West London ICT Consultants' Group. Type your name in Footer Type file name in Footer Annotating Course Work – A PowerPoint Application Year 8, Unit 5 Use this set of PowerPoint slides to. British Nutrition Foundation Conference Update from Learning Teaching Scotland (LTS) Liz Nicoll – Development Officer Health & Wellbeing September 2010. KEY STAGE 3 ICT PILOT Part of the key stage 3 strategy which also includes numeracy, literacy, science and TTL Aimed at raising standards in ICT. Using ICT in PE Whole School Issues Steve Cayley Adviser for e-Learning. 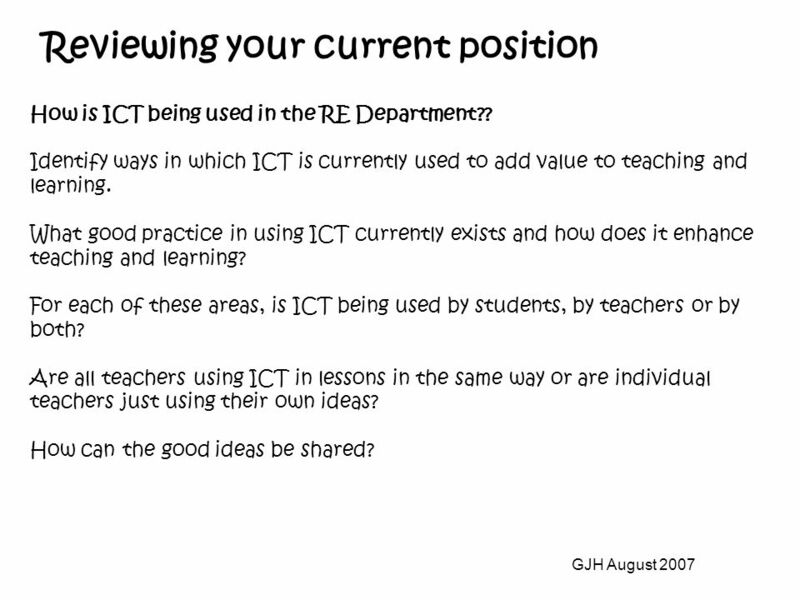 ICT in Primary Schools Presentation to Southampton PGCE course Friday, March 28th 2003.